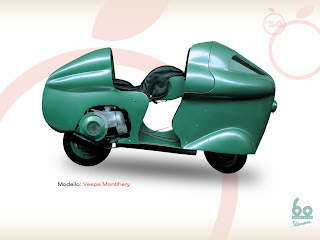 In order to promote the sporting image of the Vespa, Piaggio turned its attention to record breaking in the hope of reviving a glorious pre-war tradition. On April 7 1950 on France's Montlhery circuit, three riders took turns as the Vespa spent 10 consecutive hours acquiring 17 world records: over 1 hour (average speed 134 km/h); over 100 miles (average 129.7 km/h), 500 miles (average 123.9 km/h), 1,000 km (average 124.3 km/h), and over 10 hours during which the Vespa covered 1,049 km. 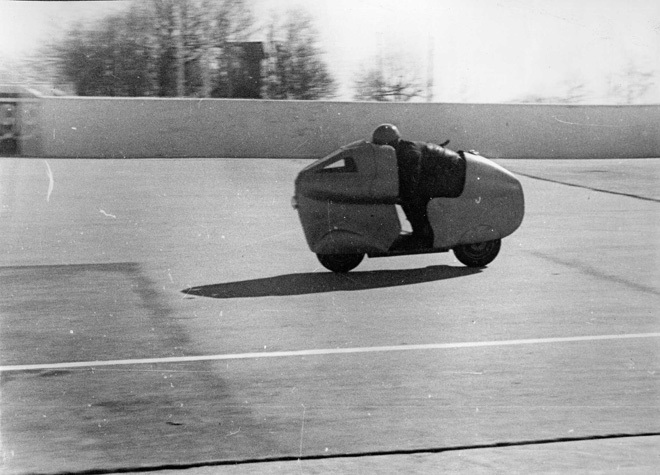 On a streamlined vehicle very similar to this (the Vespa 125 Circuit “alloy frame” of 1949) rider Dino Mazzoncini also performed brilliantly in track races, most memorably in the head-to-head between Vespa and Lambretta that took place on the Genoa Circuit (Corso Italia) and ended in a victory for Vespa in the motor scooter class.